Discussion in 'The Pub' started by dmarkj22, Apr 19, 2016. So for my birthday I've decided to go out for dinner to a high end steakhouse with a my wife and a few friends. I've been looking at different places in the LA/OC area and was wondering if there were any you guys would recommend. So far I have Maestro's, Arroyo Chophouse and Alexender's. Pacific Dining Car in Santa Monica is some old school exclusive goodness. Ted's of Beverly Hills Steakhouse. The foil covered baked potato originated at Ted's. Mngwa, DPEXP and korby like this. Need another guest? Er, you are picking up the check, right? 555 East in Long Beach is very good. It is an old school style steak house with amazing steaks. Only one I've been to on your initial list is Mastro's... but it was well worth the (high) price of admission. Mastro's has the ambience but for a truly great bone in filet you simply can't beat Ruth's Chris, IMO. Flemings is also pretty stellar. Oh yeah, really great steaks! head over to Peteyvee's estate....you wont be disappointed. 65DuoSonic, Peteyvee, Frankee and 1 other person like this. 65DuoSonic, Madsen, sanrico and 1 other person like this. My favorite is Wolfgang's in Beverly Hills. It's not Wolfgang Puck's place. It's owned by a guy named Wolfgang Zweiner, who worked at Peter Luger's before starting his own group of steakhouses. The food is excellent and it's a bit less stuffy than Mastro's. I love the food at Mastro's, but the atmosphere can feel a bit pretentious. Try the bacon as an appetizer. It's like no other bacon I've ever eaten. It's sliced thick and almost tastes like a hot dog. but when the bill comes we all seem so happy about getting it rammed up the tukus. I love this place in OC. 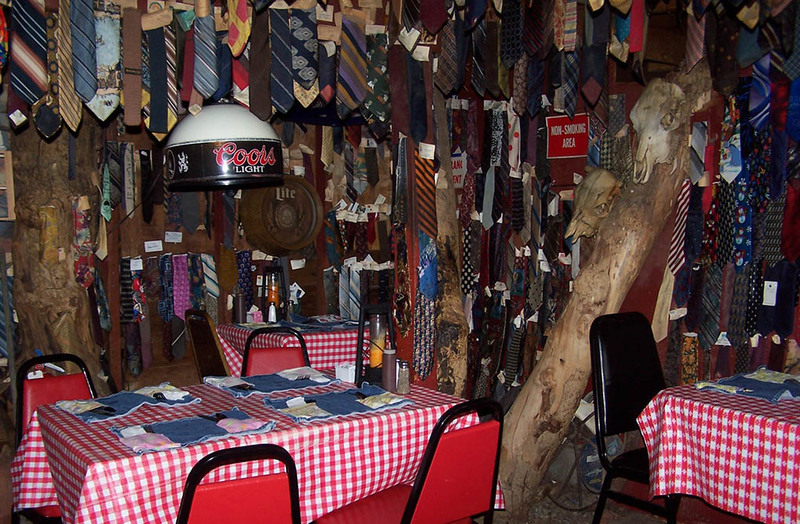 Be sure to wear a tie you don't like so they can cut it off & hang it on the wall. Also the mushrooms are great. OP, I think you'll find Chianina's in Long Beach will make you forget Mastro's. They have their own exclusive farm with their own special cows. Sorta like wagu.... Pricey, but incredible. Plus, my Chopin & Gorgonzola cheese stuffed martinis are nowhere near as expensive as they are ($22.00!) at a good steakhouse. I'm surprised no-one has mentioned Morton's; never been there myself, but quite a few folks I know have raved about their steaks. Yeah, "high end" is Morton's, Ruth's Chris, Mastros, & Flemings. I'm more of a mid-range guy, i figured the picnic table decor would make that clear. Foxfire Chophouse in Yorba Linda used to be a good place to grab a steak & chase OC "cougars", but it looks like it's closed. If you like ocean views Splashes in Laguna Beach @ the Surf & Sand is usually good. They've had some amazing & oddball chef's over the years. Not sure how it is now.